We are pleased to announce that Rev. Dr. David Peterson will be returning to Malaysia in 2016 to speak at Creation to Consummation 2016 on "Holiness - God's Gift & Challenge to His People". Rev. 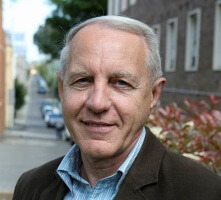 Dr. David Peterson is Senior Research Fellow and Lecturer in New Testament at Moore Theological College in Sydney and former principal of Oak Hill Theological College in London. He is the author of Engaging with God: A biblical theology of worship and Possessed by God: A New Testament theology of sanctification and holiness.